Do you work in the marine industry and use marine parts? 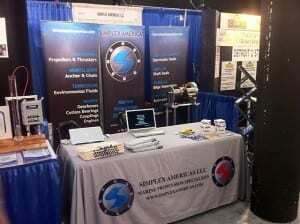 Simplex Americas will soon have their pacific marine and supply parts displayed at an expo near you. Are you interesting in learning more about the products and services Simplex Americas offer? If so, then this is your chance! Simplex Americas will be participating in the Pacific Marine Expo in Seattle, Washington from November 16th-18th, 2017. Simplex Americas will be joining more than 450 exhibitors including, equipment companies, builders, suppliers, propulsion, and more! During this three day expo, there will be daily events such as live demonstrations and The Fisherman of the Year Contest. At the end of the day, feel free to participate in Happy Hour with drinks and great conversation with the vendors. Simplex Americas will be attending this event to promote their products and services in the pacific marine and supply industry. Simplex Americas will showcase products such as shaft components, shipbuilding and repairs, stern tube seals, bearings, and couplings. Whether you are looking for assistance for your commercial, recreational or military marine propulsion Simplex Americas is here to help with all your needs in the pacific marine and supply industry! Simplex Americas is not only the leading supplier of OEM spare parts but also provides service and repairs from our skilled engineers. Whether in drydock, afloat, or underwater with diver assistance Simplex Americas is available to assist you in all your marine propulsion needs. Simplex Americas pacific marine and supply parts will be on display at the Pacific Marine Expo that will take place in the West and East Halls of the CenturyLink Field Event Center located approximately 30 minutes from the Seattle Tacoma Airport. Registration for this event can be completed at The Pacific Marine Expo website. Come check out this once great once a year event that is bound to connect you with many like-minded individuals and companies in the marine industry. Simplex Americas looks forward to the opportunity to serve you in the future!